I used to be a teacher. Not much connection there with scary monsters, but I did once hear an absolutely wonderful ghost story at a Parents’ Evening. The phantom involved is actually very famous in Nottinghamshire, but at the time, I had never heard this scary tale. 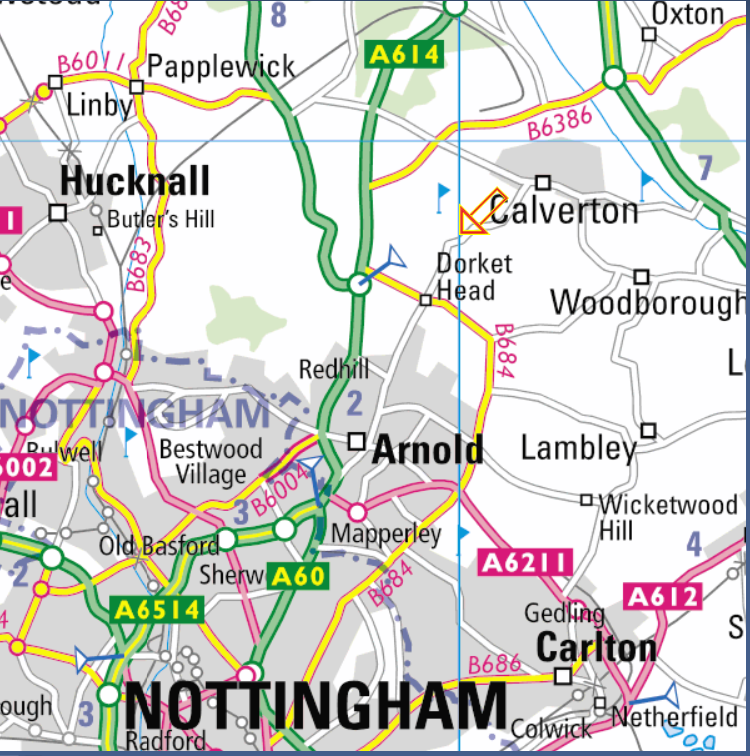 In the map above, the yellow road in the centre is the B684, the “Plains Road” which leaves Nottingham northwards and climbs slowly but surely along what must have been at one time an ancient Stone Age Ridge Route and perhaps even a hunting trail. With some amazing views, particular to the east, the road eventually sweeps around to the west to join the main road from Nottingham, the A614. This road goes northwards towards the A1 at Clumber Park, the “Great North Road”. Just before this major junction there is a minor cross roads called Dorket Head where a country lane winds northwards down an extremely steep hill. 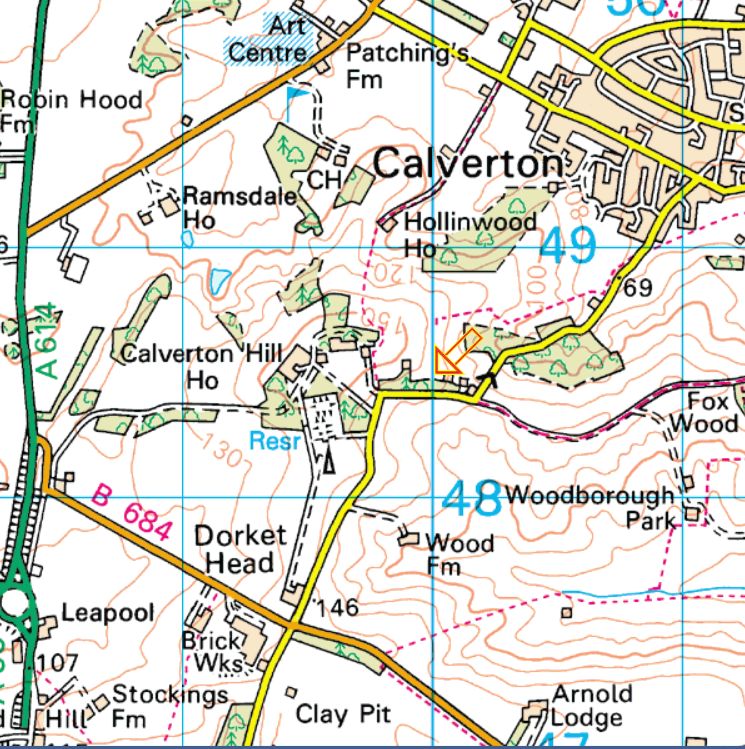 It forms a short cut down to what is nowadays the dormitory village of Calverton. The mother explained how her husband had seen the ghost and he had been so absolutely terrified that, after this, he had never ever again driven back home along this road. He therefore ignored an obvious shortcut to Calverton from his office, one which would have saved quite a lot in petrol costs over the weeks and months. Instead the husband preferred to spend his hard earned cash on driving around the three sides of a rectangle, but a rectangle where there was no possible prospect of being terrified out of his wits on a second occasion. This circuitous route ran along the B684 to the main road, the A614, and then along the next turn right, the brown road past Ramsdale House and up to the Arts Centre, and then another right turn into Calverton. The three sides of his rectangle must have included making at least one right turn across the high-speed oncoming traffic on the A614. Her husband had seen the ghost in the absolutely classic way which is featured on so many different websites about Nottinghamshire phantoms. Basically it is a very simple scenario. As you drive down the narrow road following the twisting, turning descent with great care, concentrating hard on what is ahead of you, you suddenly notice that there is somebody sitting in the empty back seat of your car. You will see the stranger occasionally in the rear view mirror when the car swings from side to side as you follow the twisting loops of the road. Sightings of your unwanted passenger will be only fleeting, but they will seem more terrifying because of this. Drivers who stop the car to look behind them invariably find that the rear seat is empty. Anyway, this particular father was so terrified that he never again even contemplated going down the hill. The ghost he saw, as far as I remember, was an old woman. The mother also told me how a very great number of people in Calverton, if they can possibly avoid it, would not consider for a moment driving down this hill for the very same reason as her husband. Ten minutes’ research on the Internet revealed that the road is called George’s Lane and the hill is called George’s Hill. The haunting seems to be most frequent at Dorket Head or at the junction with Spindle Lane. On this map, Dorket Head is the crossroads which forms the junction of George’s Lane with the B684. 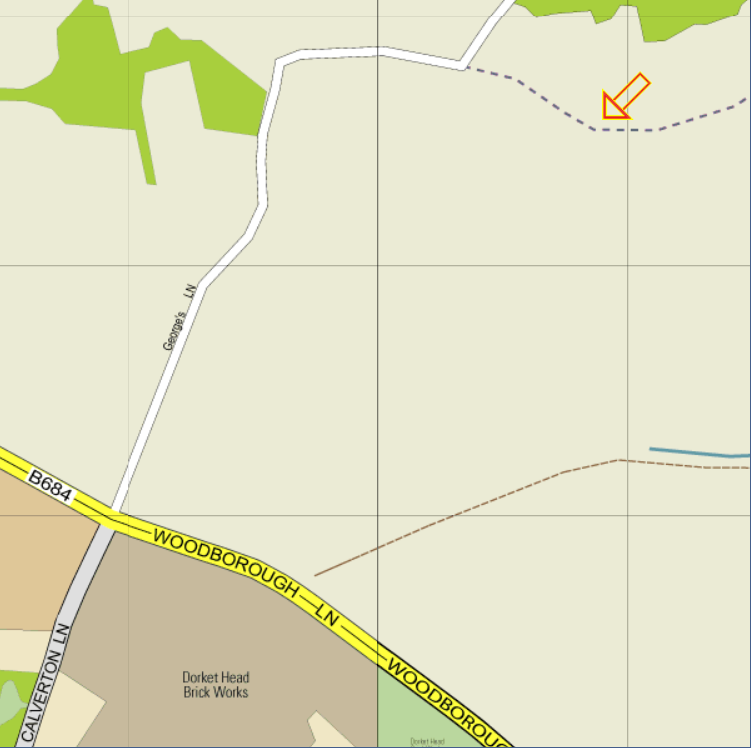 The dotted line, indicated again by the orange arrow, is Spindle Lane. Sarah Meakin of Carlton, Nottingham, returned from Calverton after some babysitting to feel the car suddenly go cold on a warm summer’s evening, and she then looked in her rear view mirror to see “a black hooded figure, which can only describe as looking like a monk”. Well, you know where George’s Lane is, and you know what might happen and you know what you might see. So off you go, and make sure you keep your eyes on the road, as well as on your rear view mirror. Thanks very much. I’m sorry my gratitude is a little belated! It’s always a pleasure to see or hear something of one’s old teachers, so I was pleased earlier today to stumble across your blog. This entry especially piqued my interest, as although I believed myself to be respectably au fait with my home city and its ghostly heritage, I wasn’t familiar with the story. Whetted, I jumped in my car and set off for George’s Lane. Needless to say, despite looking in my rear-view mirror to a nearly dangerous degree, the ghost failed to show. She probably enjoys disappointing the ones who come looking as much as she likes surprising those not expecting her. Maybe I’ll try again another time, perhaps at night! Anyway, a great tale and a fine blog – keep it up! I hope you’re happy and well and enjoying your retirement. Thanks very much for your kind words Leigh. I know that Wendy Nicolle has tried the same road without any success. I wouldn’t be surprised if the ghost only appeared when you are not expecting it.If you enjoy that kind of thing, quite a number of my blog posts are about weird stuff such as monsters so you might like to try those. Lovely to hear from you! Perhaps the ghost just wants to introduce itself to you gradually! Maybe in the future, you will actually get to see her. Good luck and don’t forget to tell us about it if you are successful! I possibly saw the same ghost in the nearby Watchwood a Forestry Commission plantation that runs parallel with the A614 access can be gained from Gravely Hollows. It was a bright sunny day in the summer of 2016 I had walked up the steep climb and leveled out I passed the white painted trig point heading north, in the area to my right a grassed scrub clearing I noticed a black cowled figure walking at a converging angle to my own path I worked out we would meet further down the path with the hope of good conversation. At no point did I think this was a ghost, until it came alongside a small tree around 6 inches in diameter its progress was hidden by the tree it never came out the other side of the tree! I arrived at the point in the path where we should have met looked at the tree and the ghosts path and saw nothing of it I even looked in the grass to see if the person had fallen nothing. On arrival home I told my wife and son and got a bit of a ribbing I left it at that until I found your article. It sounds as if this may be the same ghost that so many other people have seen. Perhaps it walks a longer circuit than people think and you saw it at a particular place where comparatively few people normally go. Second entry on the same subject, following a search on the web I realised there was considerable supernatural activity in the Calverton area, I mentioned this to my eldest son who uses Georges Hill for his work, on two occasions he admitted that he had been approached by a cowled figure in the car park at the spindle lane junction once he thought it was going to get into his van. He didn’t seem to be bothered by it! I rather think I would have been! Personally, I have never seen a ghost but I can’t see myself staying as cool and calm as your son. He was parked up in the car park at the top of Georges hill at dusk with a young lady, when the car was approached by the black cowled figure it came right up to the car as though it was going to get in, he noticed there was no face in the cowel, he now admits to being terrified! Thank you very much, you are very kind. I hope your readers enjoy it!